Fjords Hjellegjerde is a family-run business that matured into an international company producing the finest recliners and comfort solutions. They cemented a foundation in tradition and used innovation and modern design to steer into the future. The Unwind Company is proud to present the MotionConcept Chairs by Fjords! We provide fast and free shipping options daily. Call (888) 486-9463 for more details. Your Fjords furniture items are delivered fully assembled, include the Full Manufacturer's Warranty and are priced at the lowest authorized price. 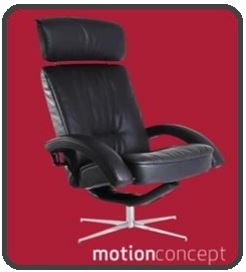 The MotionConcept Chairs were introduced in 2014! To quote Hjellegjerde: They move, respond and adapt to your body with individual with a "center-balanced, carrier, swing boom function". Fjords is beginning a revolution in comfort with the codeword *motion*. To learn more: Check out the online catalog here: [Fjords Motion Online Catalog].